Armadillo Information: Dillos are expert diggers, and they can dig up and wreck your yard in their search for earthworms and grubs. They also dig large holes in which to live, often next to a house. Fast Armadillo Removal - Call 407-956-1268 any time of the day, and we will discuss your armadillo problem & schedule a same-day or next-day appointment. I deal with armadillos on an almost daily basis, and have been working with this nuisance animal for 7 years. I do not perform armadillo extermination. 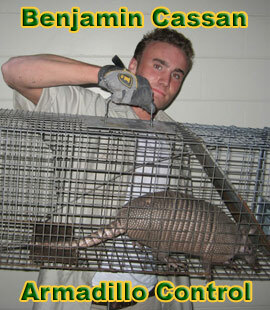 Rather, I am a humane armadillo trapper company, and I prefer to use live trapping and relocation, or exclusion. The best way to achieve effective armadillo control is to understand the animal and its behavior, and establish the appropriate course of action given the property and matter at hand. Armadillos are not bad animals, but they are common in urban areas, Orlando included of course, and I excel at solving armadillo problems quickly, professionally, and effectively. I aim for permanent results, to keep those armadillos away for good! What Kind Of Damage Can An Armadillo Do? Armadillos are creatures that aren’t native to North America, and with their strong armored hides they have proved to be a very successful species spreading across much of North America. Much of the damage that is done by armadillos happens because of their natural instincts to hunt insects and worms that live beneath the surface of the soil. This means that many people who have a beautifully green and even lawn will find that an armadillo will have dug tens of small holes in the surface of this lawn as it looks for food. Another type of damage that is often caused by armadillos is when they are to be found in urban or suburban areas, and will often try and hunt for food by digging through garbage. Their large claws can easily carve through the plastic of garbage bags, and many people will awake to find that an armadillo has opened a garbage bag and spread their garbage across much of their yard or garden. There are a number of different methods that people can use when they find that armadillos are becoming a problem, but many people will turn to a professional pest control company to get rid of the creatures. If you have any armadillo questions or comments, e-mail info@cassanwildlife.com or better yet, please call 407-956-1268 and I will answer.